As expected stock started in bullish zone but since ECB didn't cut interest rate which was highly anticipated, market sold off. 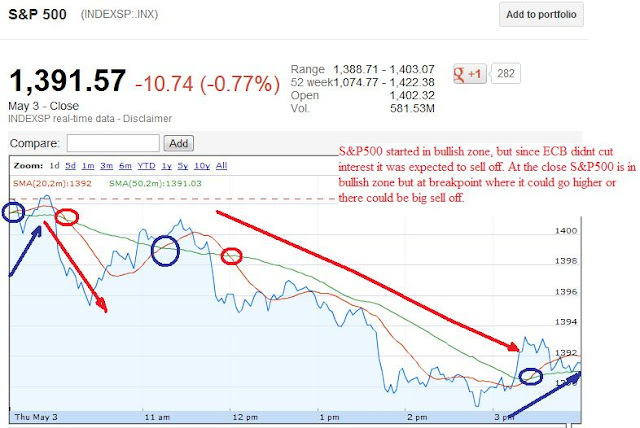 Friday and Monday is now critical point where market could sell off. If tomorrow, Job report falls below 120k, then we could see major sell off. Also, Sunday France is holding its second round of election. If Sarkozy loses and Hollande wins, market is again expected to sell off on Monday. At today's close Dow and S&P500 is in bullish zone but at a break point, either stock could rally if job report is above 175k or it would sell off if job report falls below 120k. But this is ideal condition, it is manipulated market, so watch out manipulation between 1.30 pm and 2.30 pm if there is sell off. The first level to check in Dow for upside is 13245 followed by 13265 which is important break point for the upside. While for the downside, Dow needs to break 13165 followed by 13132. The first level to check for tomorrow in S&P500 for upside is 1398 followed by 1404 which is important break point for the upside. While for the downside, S&P500 needs to break 1385 followed by 1382. Dow started in bullish zone but since didn't cut interest rate it was expected to sell off. At the close Dow is in bullish zone but at breakpoint. 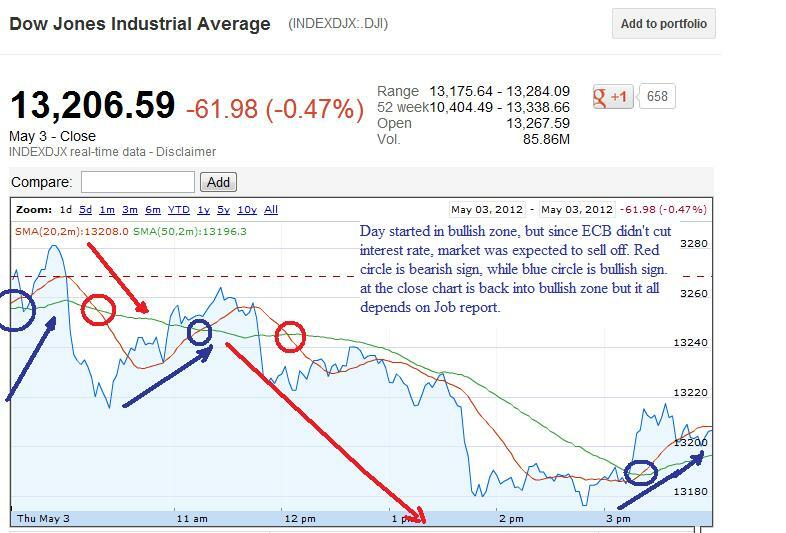 Tomorrow it could go higher if job report is good but sell off will happen at the close. Other wise 90% its bearish day. 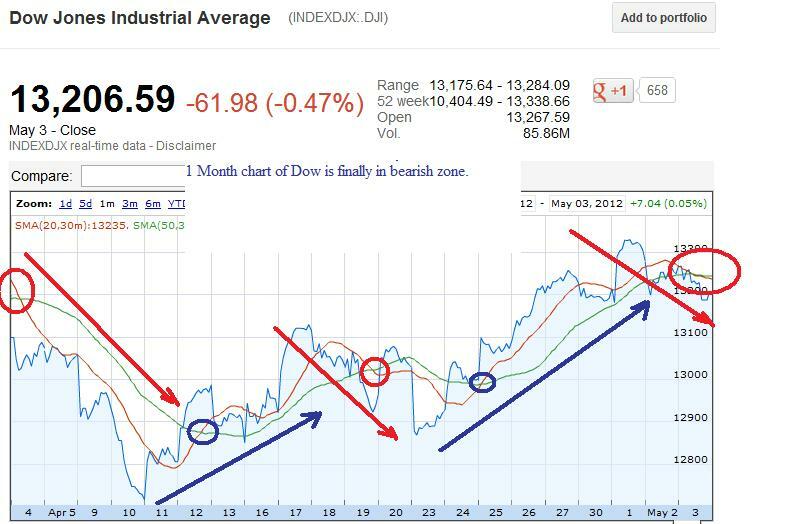 Finally 1 month chart of Dow is back in Bearish zone. Blue circle is bullish sign, while red circle is bearish sign. Tomorrow Market likely to sell even after initial rally at the close. 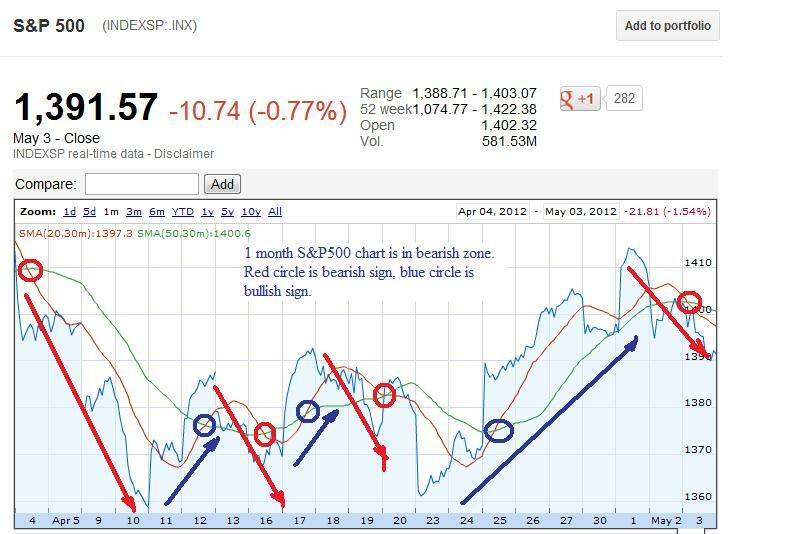 1 month chart of S&P500 is in bearish zone. For Long term keep GMCR, PCX, RVBD, NOK in your watchlist. For day trading watchout BIDU, AAPL, PCLN, MA, FAS, FAZ, TZA, TNA, TVIX, XIV, SVXY, UVXY, VXX (remember volatility is not a long term investment option use it for strictly day trading) VIX is still in contango so any rally in it would lead to sell off at close. So becareful with UVXY, TVIX, VXX. Friday's job report and Monday's France election result could be a game changer. Good luck.